Here’s to my first TWD recipe!! 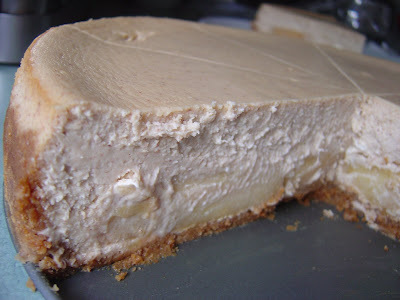 Jaime of Good Eats n’ Sweet Treats chose Brown Sugar-Apple Cheesecake (pages 218-219) for this weeks’ recipe and boy what a great job she did choosing! 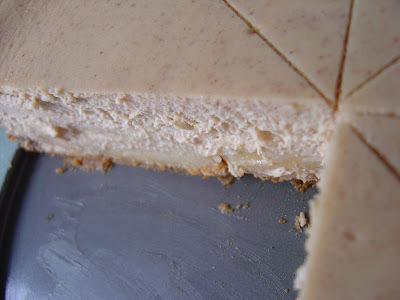 I’m a lover of all-things-cheesecake, albeit I’ve only made cheesecake a number of times. 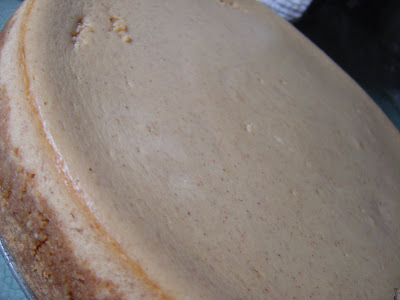 I’m always nervous to make cheesecake because there are so many ideas about the best techniques for the best cheesecake: waterbath vs. no waterbath, cool the cheesecake in the oven vs. on the counter, baked vs. no-bake, a crack should be there vs. shouldn’t…you get the point. But because I’m such a recipe-follower, I wasn’t too nervous about making this one. I know that Dorie’s recipes are tried and true and that all I would need to do is follow her recipe. Easy enough. Easy? Yes. Quick? No. It took me 1 and 1/2 hours to prep this cheesecake because I was so afraid of screwing it up…and lord knows I didn’t want to screw up my first TWD recipe! I had to take extra precautions to be sure that everything I did was right…that the crust was browned enough but not too much, that the apples were cooked enough without burning the brown sugar, that the cream cheese was soft enough so the batter wasn’t lumpy, that the springform pan was wrapped tightly enough so no water would leak into my masterpiece. It certainly was a process but the proof was in the pudding…err cheesecake…that my precautions and all that extra time yielded one hell of a cheesecake…and a cheesecake WITHOUT a crack!! This was a first for me and was the first indication that I felt that I really did everything right. The only little blemishes on the top of the cheesecake came from the aluminum foil that stuck to the cake as it rose in the oven – no biggie! Because I made the cheesecake last night (Monday night), I had to let it chill overnight before cutting it which was fine because I feel more comfortable taking pics during the daylight rather than at night…and coincidentally, I hadn’t had breakfast this morning before cutting the cake and taking pics. Aww shucks….cheesecake for breakfast? What a bummer! Well, somebody had to taste it in order to write this review! Dorie certainly was right – this is a substantial cheesecake. 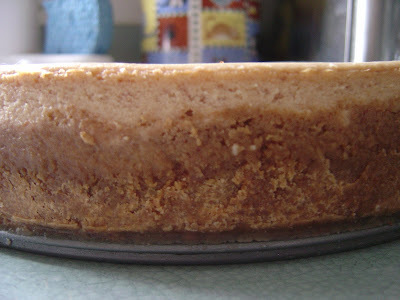 Not heavy and dense like NY cheesecake, but creamy and almost light…but substantial in taste it is. The cheesecake never fell in the middle while cooling and resulted in this beautiful dessert flecked with cinnamon as the highest (thickest?) cheesecake I’ve ever made. I did have to restrain myself from eating a whole piece this morning because I did only cut it 8ths but it was oh so good! (And in the future, I will definitely use dental floss again to make the initials cuts and then a hot, clean knife to finish them off.) I offered to put a piece in Kyle’s lunch today but he said that he’d wait until tonight to try it and I almost feel bad about not waiting for him…almost. Check out how everyone else did here! Center a rack in the oven and preheat the oven to 350 degrees F. Remove the pan from the freezer and wrap the bottom tightly in aluminum foil, going up the sides. Place the pan on a baking sheet and bake for 10 minutes, or until the crust is set and lightly browned. Transfer to a rack to cool while you make the apples and the filling. Leave the oven at 350 degrees F.
Bake the cheesecake for 1 hour and 30 to 45 minutes, covering the cake loosely with a foil tent at the 45-minute mark. 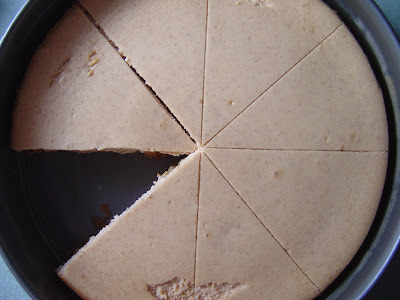 The cake will rise evenly and crack around the edges, and it should be fully set except, possibly, in the very center–if the center shimmies, that’s just fine. Gently transfer the cake, still in the pan, to a cooling rack and let it cool to room temperature, then refrigerate it for at least 6 hours; overnight would be better. Run a blunt knife around the edges of the pan to loosen the crust, open the pan’s latch and release and remove the sides. Looks fantastic! And it took me forever to do as well… I just didn’t want to have to do this recipe twice! Cheesecakes are always better for breakfast! I mean, this one had fruit, dairy, carbs… totally a balanced breakfast 🙂 And a beautiful one too! Your cake looks fantastic!! And dental floss is genius! I’ll have to remember that for next time 🙂 It looks perfect! I’ve never heard of using dental floss to start the cuts in a cake! Intriguing. I think I’d be too impatient to do something like that, even though it does look nicer. Anyway your cheese cake looks perfect! Well done. I can definitely relate to taking extra time to make something because I’m so paranoid and want to get everything just right. Water bath always for cheesecake! If you don’t want cracks that is. Great job. Your cheesecake looks great! I also had a problem with the foil sticking to the top of mine. It rose more than I expected. And there’s absolutely nothing wrong with cheesecake for breakfast, or any other baked good for that matter. =) My husband always gives me grief for eating leftover apple pie for breakfast. Hey, it’s got fruit, right? What’s wrong with that? Oh wow! I could lick the screen. It looks fantastic!